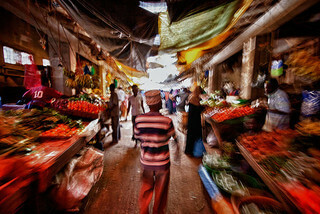 Lamu Old Town gives the visitor a fascinating glimpse into a nearly-forgotten world. The best-preserved and oldest Swahili settlement along coastal East Africa, this UNESCO World Heritage Site, about 250 kilometers north of Mombasa in Kenya, features architecture that clearly shows the mishmash of influences – Bantu, Arabic, Persian, Indian, and European – that influenced the creation of Swahili culture. In Lamu Old Town, you’ll find a warren of narrow streets, navigated only by the ubiquitous donkeys (there are no cars on Lamu Island) that fuel commerce and transportation, and leave their calling cards at every intersection. You’ll want to spend an afternoon, at least, wandering these vibrant, bustling streets (watching your step carefully, of course), poking your head into the countless small dark shops that sell everything from leather sandals and traditional carved wooden boxes to groceries and cigarettes. If you take the time to talk to shopkeepers and others, you’ll find a friendly, welcoming people who are as likely to invite you home to dinner as they are to sell you a trinket. The houses, many built of traditional coral stone and mangrove lumber, are characterized by beautifully carved wooden doors opening into airy inner courtyards that catch every ocean breeze. Although most of Lamu Old Town’s best sites are found just by walking the streets, there are several small museums, including Lamu Fort, an imposing structure built by Sultan Fumo Madi ibn Abi Bakr on the seafront in the early 1800s. Extend your visit to include a snorkeling expedition or do some deep sea fishing. Lamu features a range of accommodations in Swahili-influenced buildings, and you’ll find some of the freshest seafood in East Africa at Lamu’s restaurants. Last updated by jack on 17 June, 2013 in Destinations.